Banish the ‘boredom’ for good! What’s the best thing about Christmas? You’re never stuck for something to do with the family! Here are some of our top choices for having a magical family Christmas. Is there anything more magical for a child than getting to see a chocolate factory? Visit the Butlers Chocolate Experience and witness first-hand what goes on behind the scenes at the Butlers Chocolate Factory. From the interactive chocolate museum to real-life chocolate-making demonstrations, this is a fun-filled experience for the whole family. Did we mention you get to decorate your own chocolate figure? Unleash your inner chocolatier; for the truly competitive, there are even personalised participant certificates! 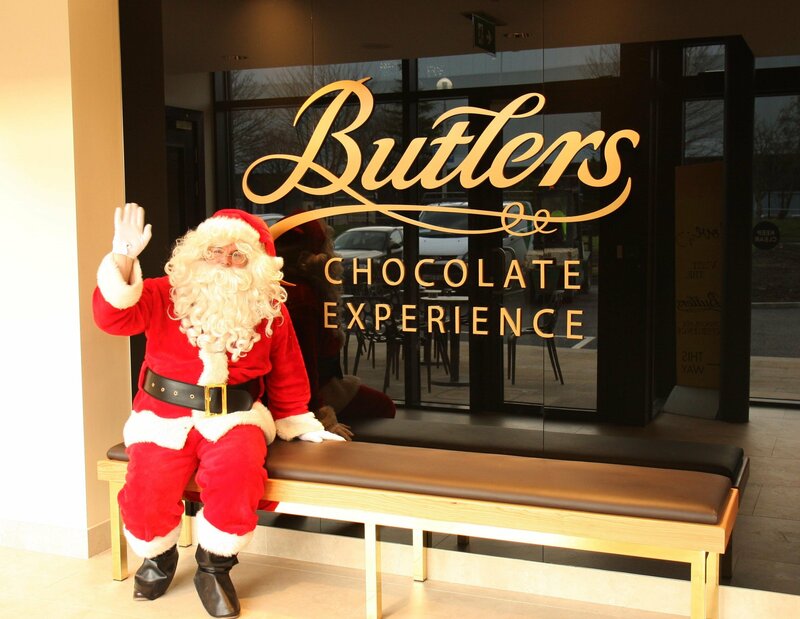 Don't forget Santa makes a visit to the Butlers Chocolate Factory too, so when the busy job of chocolate making is done, sit back, relax and refresh with our signature hot chocolates adorned with marshmallows for sustenance, while you and the kids wait to see Mr Claus himself. As well as spending time talking with Father Christmas, each child gets a lovely little present to take away before he does the important delivery on Christmas Eve. One of the best Christmas traditions is surveying the various Christmas window displays no matter where in the country you are. And wait till you see the Butlers Chocolate Café windows! With their signature red and gold, the windows at Butlers Chocolate Café are always guaranteed to be a visual feast. And look – what is Christmas without Christmas lights? From the huge gleaming bells on Grafton Street through to impressive lighting displays in Galway City, Cork and Limerick, you can't fail to see the festive lights switch on - one of the first real indicators that Christmas is here. He’s at the Zoo, the Airfield Estate, Liffey Valley, Blanchardstown, The Jervis Centre and Croke Park – there’s even an Elf Post Office in the Ilac Centre. Don't forget he'll also be in residence in his cabin in the Crescent Shopping Centre in Limerick throughout December for any last minute change of mind updates! For parents waiting in line, be sure to grab a Butlers coffee for a much-needed caffeine hit to sustain you while you queue with the little ones. If your little ones need a little downtime from all of the festivities, a Christmas movie, cosy on the couch is always a good idea. Maybe they've exhausted all of the latest films, so why not introduce some 'classics' from your generation? You'd be surprised at how well The Sound of Music still appeals to all ages. Make it a real treat and crack open a pack of Butlers new signature line of your most favourite chocolates while you're at it. The Carol Service at Christchurch Cathedral and The Snowman in the National Concert Hall are two of the most festive and atmospheric experiences you can have at Christmas in Dublin – and perfect for all the family. Pick up a steaming coffee and a babyccino for the little ones from one our nearby Butlers Chocolate Cafés on Grafton Street or Liffey Street. If you miss out on those, you can stroll through the streets and the buskers will recreate the experience for you!